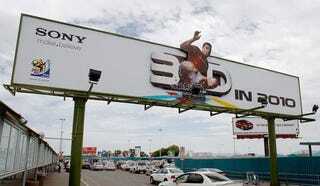 The World Cup kicks off tomorrow, and ESPN has signed up three advertisers for its 3D channel. If you're watching South Africa Vs. Mexico, keep your eyes peeled for Sony, Gillette and Pixar adverts (if you own a 3DTV). It's not the first 3D game ESPN has broadcast, with a couple of Masters Tournament golf matches being screened previously, but it's going to be the first showing which could potentially lure in the viewers. It's little wonder then that Sony has chosen to hire Real Madrid footballer Kaka for their advert; Pixar will be showing off the soon-to-be-released 3D film Toy Story 3 and Procter & Gamble has worked on an ad for the Gillette Fusion ProGlide razor.